The air forms a fog around my mouth as I watch my friends carry a coffin marked “Egyetem”—in English, “University”—across Parliament square. They march slowly, matching the dirge played by Rhythms of Resistance drums. When they set the coffin down, we encircle it, then bury it under soil and rocks, raking up the dirt with our hands. After a moment, one of our group digs a small hole in the soil-pile with his fingers and plants a seedling. We water the plant using a spare teakettle and join arms. When I first joined the Szabad Egyetem (Free University), we were just a rag-tag group of students from the Central European University trying to keep our school from being kicked out of the country. By December 12, 2018, our small group had joined the 10,000 who came together in protest against the right-wing Fidesz party, led by the despot-populist Viktor Orbán. For a frigid week, we camped in front of Hungary’s parliament to protest a regime that wanted to shut down our school, as well as a way of demonstrating the importance and resilience of education. Despite our organizing, on the first day of December, CEU announced that it would be moving to Vienna, Austria. After the announcement, we held our funeral for “Education.” There, Hungarian students recited eulogies for their country, their youth, and for academic freedom in front of the most nationalistic space in all of Hungary. 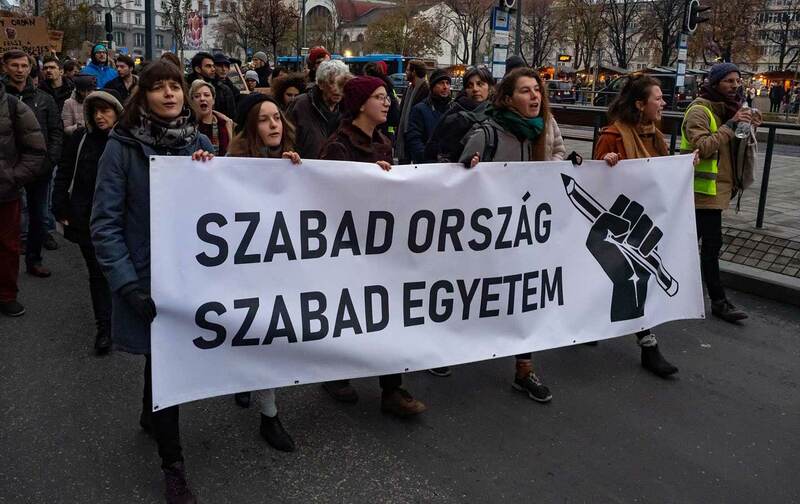 Though we did not convince the Hungarian government to stop its senseless assault on CEU, Szabad Egyetem actually accomplished a much more important and sustainable achievement: We created a movement of students and free-thinkers dedicated to fighting against Orbán’s despotic regime. Though Orbán sought to stamp out dissent and free thought in Hungary, he only made us call out to one another in solidarity. We students of CEU were soon joined by Corvinus and ELTE students. Together we spent the occupation in a tent filled with leftist organizing discussions and strategy. This happened despite the fact that modern Hungarians (particularly the younger generation) are generally reluctant to protest; the legacy of the ‘56 revolution—when after three weeks of protests against the Communist regime, Soviet tanks rolled in, killing and wounding thousands—and the subsequent decades of oppression still hang over the nation. Since the fall of Communism and the subsequent rise of Fidesz, there have been a handful of truly in-the-streets demonstrations—sporadic likely because of Fidesz’s strategies of media manipulation and suppression of dissent. During our occupation (and the weeks of organizing leading up to it) we did what students do best: We learned. We learned how to plan protests and marches. We learned how to set up tents in the freezing rain and how to plan an open university. And I certainly learned the most I’ll likely ever know about Budapest municipal noise ordinances. But most importantly, we learned solidarity. And it was this solidarity that carried us as Hungary plunged into what appears to be a moment of genuine and historic tumult. Protests broke out on December 12, when Orbán’s administration forced two laws through parliament: a law giving the government power over the courts (seen as yet another step by Fidesz to establish autocracy) and the “Slavery Law,” which allows employers to force their employees to work up to 400 hours overtime annually. Not only is this law unjust and burdensome to the already strained working class, Orbán and his party functionally ignored the entire democratic process by cutting off the microphones of opposition MPs while it was being debated in parliament. Hungarians across the country watched in rage—via Facebook Live or broadcast on one of the few independent media outlets—as Parliament descended into chaos, with opposition members blowing whistles and calling for radical action. Outside, there were upwards of 10,000 people carrying flags and banners in Parliament Square, holding phones and smoke bombs aloft. Some were wearing yellow visibility vests—inspired by the gilets jaunes protests in France. Around me, people shouted Fidesz mafia! and Victator! Police officers looked on in astonishment—particularly, I saw, when one demonstrator snatched a state-issued beanie off an officer’s head. No one—not the police, not Orbán and Fidesz, not even the demonstrators themselves—expected this outburst of genuine, vocal dissent. Perhaps these laws were simply the straws that broke the camel’s back when it comes to the erosion of democracy in the post-Communist state. Or perhaps protesters were motivated by the workers’ movement of the gilets jaunes—or perhaps by our small but vocal demonstration. It may simply be that movements are unwieldy and unpredictable, and December 12 was simply the day for it. But whatever the reason, we learned two new lessons. First, these protests are serious, and they are violent. Police arrived quickly, appearing like bullet ants in their black body armor and glinting helmets as they circled the parliament building. Demonstrators trying to enter government buildings were beaten back by the police; as people rushed the door, the officers swung at their ribs with riot batons, often resulting in a sickening crack. Many of us were pepper-sprayed repeatedly, and a fellow student at CEU was arrested and jailed. Acknowledging possible violence was one lesson. But the second was that the greatest weapon those in this movement have is solidarity and the capacity to learn from one another. A key reason these protests have been sustainable is because they are built on alliances between labor unions and student groups. During the Szabad Egyetem occupation, our group hosted a group of Hungarian union leaders. It was at this event, hosted in a leaky tent, that the labor representatives and student leaders first collaborated. While students have the idealism and energy to organize on the ground, labor unions often have the skill and more substantial ties to community networks. Unions can teach students about strikes and negotiating with the frustrating Hungarian political parties, while students can push and critique in new ways. We can learn from each other. And simply put: We are stronger together. On December 16, the protests increased from 10,000 to 15,000. The streets are alive with chants; from all across central Budapest you hear Solidaritás! (Solidarity!) ringing out. And across Hungary villages and cities other than the capital are protesting as well; for the first time since the fall of Communism in 1989, all 19 counties of Hungary are planning a massive action on January 19. But more important, I would argue, is what is happening after the protests, in people’s homes, in bars, and in classrooms after-hours. Now organizers from across Hungary are meeting and planning and exchanging ideas—organizers who never would have interacted if these protests hand not begun in the first place. Where Orbán tried to crush dissent, the people responded by organizing, sharing, and learning from one another. Like the seedling on our coffin, this revolt cannot merely be buried; through any amount of soil, it will only grow stronger and stronger as it pushes up toward the light. Rosa SchwartzburgRosa Schwartzburg’s writing has appeared in The New York Times, The Nation, The STAND, Bustle, BUST Magazine, The Bard Free Press, and many other places.